Last month, I participated in a mom fitness challenge; I’ve done the same challenge before and knew this would be a good way to jump start my post-baby fitness. My team actually won, so that was pretty neat, but the best part was all the motivation I received from my teammates and the other mamas in the challenge. This morning, we had a celebration at the park with goodies and prizes, and I contributed little crafty gift bags for the first, second, and third place teams. For first place, I did three cards for each of the winners — except myself, of course. For second place, I did two cards, and for third place, I did three simple gift tags. I’ll show you my favorites from the prize bags throughout the week, but right now I want to show you a Christmas card I included in the first place bags. I’m really proud of this card. Not because I think it’s the best card ever or anything, but because I really left my comfort zone for it. I was inspired by the single-layer card challenge at The Paper Players. I know I am too late for the challenge, but it really had me mulling over different ways to do single layer cards all week. I was making invitations for a baby shower (also another post to do!) and cards for my Stamp-of-the-Month club members all week and had little time for anything else. But I mulled! Single layer cards are hard for me. Because ohhhh, I just need a little strip of designer paper here, and ohhhhh, can’t I just pop out my sentiment on Dimensionals? Simple and easy is complicated and hard for me. I also have a hard time with Crumb Cake in large doses. An entire card base made out of Crumb Cake cardstock? But… it’s so… bland. It’s just not my color. I’ve also been struggling with how to use the Gorgeous Grunge stamps in my cards and scrap pages. I like clean, pretty, and cute and have a really hard time with vintage and grunge. So this card is like my stamping nightmare — except that it isn’t. I actually love it, and as a result, I’m warming up to single layers, Crumb Cake, and Gorgeous Grunge. I’m growing, as a person. 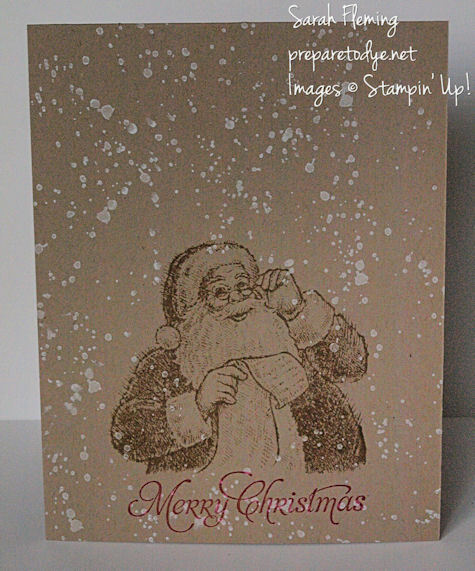 I stamped Santa in Baked Brown Sugar ink on the card base. Then I decided to try using one of the Gorgeous Grunge stamps to make snow for our bearded friend. I used Whisper White Craft ink, and this stamp worked perfectly. Then I stamped my sentiment, from the More Merry Messages stamp set, right under Santa, and I was done. A painfully simple card. You can buy all of these supplies 24/7 in my online Stampin’ Up! store. There are only seven days left to sign up for My Paper Pumpkin and get your first two months for $10 (half off). Use the promo code “PUMPKINDEAL” to get the discount.